A #FakeMemory You Have To See To Believe : The Picture Show Photos from childhood can often elicit rich memories, even when we can't truly remember the event. We asked you to share your favorite #fakememory on Instagram; this is what you told us. Remember your childhood? Seriously, do you really remember, way back to when you were tiny? And if you do, what are those memories shaped by? Chances are, they're influenced not just by what you truly remember, but by old photos and family stories. Inspired by this concept, we asked our followers on Instagram to share their "constructed" memories with us. We called it #fakememory, and received some incredibly poignant stories. Faren Shear, 2, with her mother and grandmother. 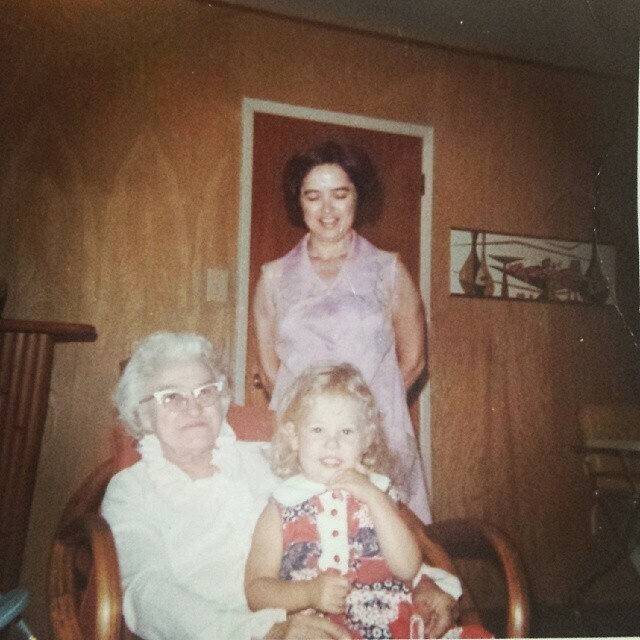 "Every Mother's Day, I tell someone how I was nearly 25 before I realized every 'memory' I have of my mom is actually from photographs I had stared at for years." Faren Shear, of San Diego, is about 2 years old in the family photo she submitted. She's sitting on her grandmother's lap as her mother smiles down on them. "We don't look related, because we're not — I'm adopted," Shear says. "So I always think these pictures are funny because I'm this super blond tall child in a family of short, dark-haired people." For Shear, this and every other image of her mother has huge significance. "My mom died when I was 5, so I actually don't think I saw a picture of my mom until I was maybe 16," she says. "All that stuff just got put away, and my dad got remarried and nobody talked about it, or her, or anything. "And so all I can do is make up a story. It's like, I have the pieces, but everything else is in my head," she explains. Part of Shear thinks she remembers this moment in the photo, but in truth, she says she has no memories of her mother that aren't posed and still. For Shear, the images mean the difference between having her mother in her life or not remembering her at all. The family photo Olivia Howell submitted reminds her of her own mortality. 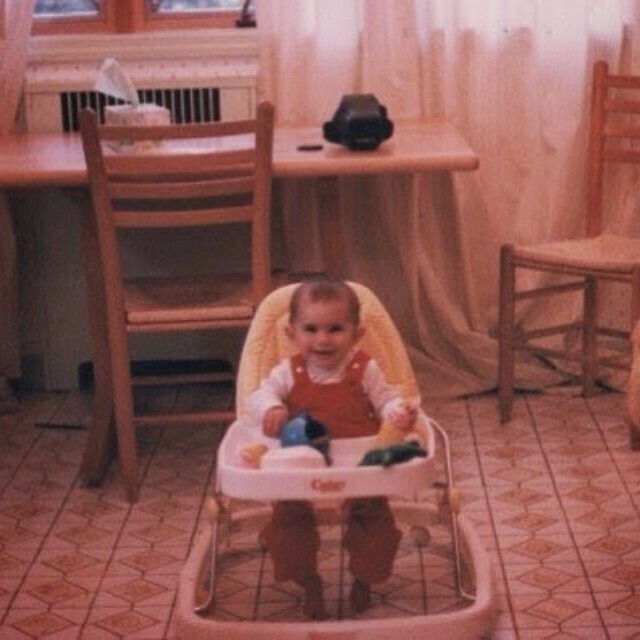 It was taken when she was about 8 months old, the morning before she went into the hospital for open-heart surgery. The last photo of Olivia Howell before she underwent open-heart surgery. "I most likely don't really remember this moment," she says. "But from all the stories my parents and grandparents tell, I could swear I remember holding their hand through the crib, the posters on the wall of Columbia Presbyterian hospital and the other babies in the ward." Seeing the image, you'd never know that Howell, who lives in Long Island, was going into what she describes as a "defining moment" in her life. "I obviously didn't know what was going to happen. ... Having this photo means I existed, and I was literally the center of somebody's universe," she says. "It could have been the last photo of me ever taken." Debra Jenson's picture highlights what has become an unusual family tradition. 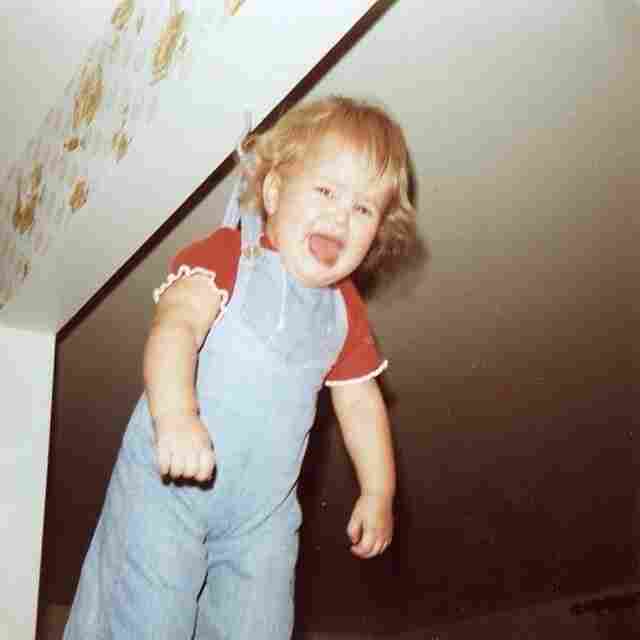 Debra Jenson, 2, hanging from a hook in her grandmother's kitchen. "Over the next 35 years, I watched each of my cousins, then my own children and my cousins' children be dangled from that hook. Between the photo and watching it happen to others, this is a powerful 'fake memory' for me." So many of our memories are informed by images of moments we don't actually remember. But they happened, right? So we want to know: Do you have a fake memory based entirely on old photos you've seen of yourself? Moments you think you remember only because you've seen a picture? "I'm dangling from my overalls, hanging from a hook ... and what you can't see, I hope, are hands ready to catch me if I fall," she says. "In my head, I think that I remember hanging there and crying for someone to get me down, but I'm sure that that's not real." Jenson, of Ogden, Utah, says the image — and subsequent generations repeating the same toddler rite of passage — epitomizes her family. Recently, her grandmother sold the house, and with it, the hook in the kitchen. "We actually all said nobody else can have babies because there will be nowhere to hang them," she laughs. Many of our Instagram followers have great attachments to these photos, even if they don't have fully formed memories of those events. "When you're looking at photos, what you're doing is you're reactivating your brain — those mental experiences that you had," says Linda Henkel, a cognitive psychologist at Fairfield University who researches how photographs shape our memories. "You're thinking about what you thought about [that day], you're looking at the color of the shirt. 'Oh, my gosh, look at how beautiful that blue is — I remember that shirt,' " she says. "You're reactivating the neurons that are involved in creating that memory experience, and those are all of the things that are going to benefit memory." The repetition of looking at photos and hearing the same stories helps the memories harden in our minds. While most of our photos are digital these days, printing them out can help with this act of repetition. For tips on preserving your digital life in photos, check out this story. And to see more #fakememory submissions, go here!